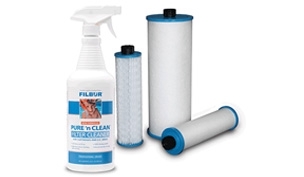 Purify your water before you fill your pool or spa with the new Micro-Klean fill cartridges. Available in both a pleated and disposable version these filters reduce total dissolved solids (TDS) from your water and increase the quality of your pool or spa water. Our pre-filter is 90% efficient and removes the following contaminants; dirt, sediment, rust, calcium, iron and copper. Attach the micro-Klean filter to the end of any garden hose and begin the fill...it’s that simple!